Ten years ago, a tragedy changed the town of Harmony forever. Tom Hanniger (Jensen Ackles), an inexperienced coal miner, caused an accident in the tunnels that trapped and killed five men and sent the only survivor, Harry Warden, into a permanent coma. 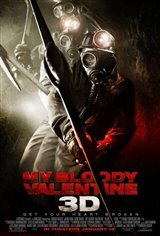 Then, exactly one year later, on Valentine's Day, Harry Warden woke up... and brutally murdered twenty-two people with a pickaxe before being killed. Ten years later, Tom Hanniger returns to Harmony on Valentine's Day, still haunted by the deaths he caused. Struggling to make amends with his past, he grapples with unresolved feelings for his ex-girlfriend Sarah (Jaime King), who is now married to his best friend Axel (Kerr Smith), the town sheriff. But tonight, after years of peace, something from Harmony's dark past has returned. Wearing a miner's mask and armed with a pickaxe, an unstoppable killer is on the loose. And as his footsteps come ever closer, Tom, Sarah and Axel realize in terror it just might be Harry Warden who's come back to claim them.